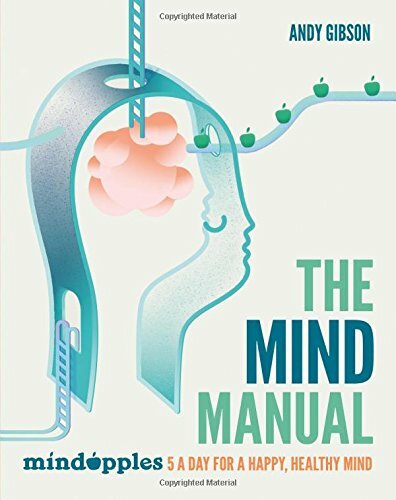 My new book, The Mind Manual, is out in the UK today. It's an illustrated guide to how your mind works, written in collaboration with Mindapples and published by Octopus Publishing. It's all new content, using the same accessible approach we took to A Mind for Business in 2015. I'm really proud of it for two reasons. Firstly, after ten years of talking to the public about mental health and wellbeing, this book has finally given me a chance to share some of the things I've learnt from all the tens of thousands people I've spoken to. I've been sharing what I've learnt and asking people to do the same, and I've learnt a lot, not just about the mind, but about what actually helps people. In particular, I've found that setting goals and trying to "think positive" is less important than feeling accepted, and accepting yourself. As I put it in the book, "Good mental health isn’t about constantly trying to change yourself, it’s about learning to live with yourself." What people seem to get from Mindapples is a sense that they are normal, that what they experience isn't weird or unhealthy, but part of being human. Understanding that seems to be more important than trying to change it. The second is that the book itself has been so beautifully designed and illustrated by the team at Octopus (big love to commissioning editor Sarah Ford and all the team there), and particularly by the amazing illustrator Abigail Read. Abi did an amazing job capturing the essence of Mindapples and her work doesn't just explain the content, it illuminates it. Some authors just focus on words and even prefer plain, classic styles of presentation, but I am the opposite: if I can use graphics, colours, layout and other visual tools to get my point across, I'm all for it. Perhaps that's because I grew up reading graphic novels and guides to visual communication, or perhaps I'm just illiterate. Either way, I'm proud that this new book isn't just informative, it's a beautiful object too. I even like the thickness of the cover, which shows you what a nerd I really am. Most of all, though, this book is another piece of the process to make looking after our minds as natural as brushing our teeth. I started Mindapples back in 2008 (look out for our 10th anniversary celebrations later this year), and although the mental health sector has changed hugely for the better since then, there's still a long way to go. I wrote The Mind Manual because I think understanding our minds should be a basic component of modern life, taught in schools and discussed throughout our life and work. In fact, I find it hard to imagine I could live a good life without knowing what I know now. So I hope people find this new book as illuminating to read as I found it to write. And most of all, I hope it helps get more people talking about their minds, and looking after themselves and each other. What a nice world that would be. Restless improviser, author and entrepreneur. Mainly runs Mindapples and currently writing about the human mind and new ways of working. Also tinkering with a few side projects. Latest book, A Mind for Business, available now published by Pearson. Later today I'll be speaking at the IABC World Conference in New Orleans, about how we can harness people's minds better in business. The talk builds on my work in the UK and US with businesses like JP Morgan and News International, and the content of A Mind for Business, but I'm going to focus particularly on employee engagement and mental wellbeing. The world of employee engagement is fairly established these days, and the topic certainly seems to be more prominent in most CEOs' minds than wellbeing or (scary) mental health. After all, if your biggest expense is your wage bill, you want to know the money you're spending is delivering value to your business. The trouble is, if you're serious about staff engagement, I simply don't believe it's possible to treat it in isolation from wellbeing and other areas of business psychology. Put simply, if you only focus on engagement, you miss half the picture, and that makes it impossible to manage your business properly. Engagement, as it's typically used, encompasses two aspects of psychology: motivation and concentration. Put simply, an engaged employee is usually seen as one who cares about their work and is able to focus on it effectively. The motivation element has been the subject of much debate and research in recent decades. Motivation means being eager to act, and it's very much about doing, not thinking. It's not the same as willpower, which is forcing yourself to do something that doesn't motivate you. Genuine motivation is where action feels easy, where doing a task feels effortless and enjoyable. Because of this, it's a very emotional process, and not one that can be engineered simply by financial incentives or threats of punishment. It's about having a personal connection to the task, some reason why it feels like the right thing for you. Motivation, then, is personal, and emotional. But it isn't a luxury, it's an essential ingredient of modern working. Without the genuine commitment to your work, it will be harder to think creatively about it, put in extra effort to get the job done well, or inspire others to do the same. No wonder writers like the wonderful Dan Pink have proved so popular: motivation is good for business. So far so good. Now let's look at concentration. Concentration is a complex thing in psychology, because it is closely related to attention and consciousness. What we usually mean in day-to-day language is, can you focus on what you're trying to do, and apply your mind to it, or do you keep getting distracted and find it hard to think about it? Or to put it another way, how effective are you at applying your mind to the task at hand? This isn't just about how motivated you are: concentration comes from a number of factors. You need to be free from distractions, able to concentrate properly. You need to have enough mental energy to put your mind to work effectively on the task at hand. And you need to be free from stress and worry, those negative loops that preoccupy our minds and distract from what we're doing. Concentration, then, is similarly emotional, and personal, and like motivation, it really matters. 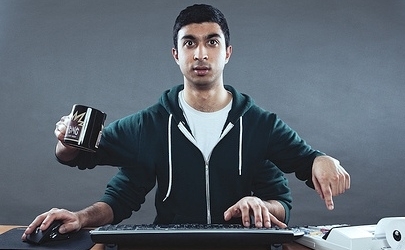 Tired, stressed, distracted people do worse work, miss possibilities and make bad decisions. To be effective at work, you need to maintain your physical and emotional wellbeing, otherwise all the motivation in the world won't help you apply your mind effectively to the task at hand. What's more, people who care deeply about their work, their colleagues or their customers, are more likely to become stressed. Stress is a response to a threat, a sign that we feel endangered, and it is a sign that something important to you is at risk. The easiest way to cut out stress at work is to stop caring - the archetypal "more than my job's worth" response. But it's good to care. And if we want people to be engaged at work, we have to find other ways to beat stress. Companies that work solely on employee engagement, then, often end up with a stress problem. To really build an effective workplace, you also need to manage the stress levels of employees, and help them feel calm as well as engaged. In fact, managing these two factors together can help make sense of a lot of familiar patterns at work. Here's how the two elements combine to create various positive and negative effects on performance. Low motivation, low wellbeing: employees in this state languish, unhappy where they are but unable to get another job. They can be bad for the morale of other people around them, they don't do good work, and they aren't enjoying themselves either. Low motivation, high wellbeing: employees in this state coast, doing minimal effort and enjoying themselves. They might be fun to be around, but they can often frustrate people around them who are more engaged and working harder. High motivation, low wellbeing: employees in this state work hard and get things done, but they burn out. There's only so long you can go in a state of emergency before your body and mind start to suffer ill effects, so these people are most at risk of stress-related illnesses and breakdowns, and need to be supported. High motivation, high wellbeing: this is the sweet spot, a state of flow where action feels easy and we do our best work. This is what we are really aiming for with employee engagement: a state of concentration and application that is as enjoyable as it is productive. How much time do you spend in a state of flow? Do you find you're often able to concentrate and enjoy your work, or is it a daily struggle to stay focussed? And what can you do to help your colleagues reach this state more often. This is why wellbeing at work is so important: because it is the key to sustainable engagement, where we are most productive and enjoy our work too. Managing stress, educating employees about looking after their minds, and helping managers support their people better, are all essential to running a modern business. This isn't a luxury to be done once the work is complete: it's the basic building block to high performance, and we neglect it at our peril. Read more about reducing stress and boosting motivation in A Mind for Business (Pearson/FT Press, 2015), out now in the US, UK and worldwide in paperback and Kindle. I am writing this in the CitizenM hotel in Manhattan, contemplating two weeks of speaking engagements in the US to promote Mindapples and A Mind for Business. To my surprise, I find myself with a rare moment of quiet to post about some of the new projects I've started working on recently, so I thought I'd post a few thoughts here, because, well, sharing is good, right? Those of you who've followed some of my talks over the past year will know I've been developing an interest "secular spirituality". I spoke about this at Secret Garden Party, Wilderness and Sunday Assembly London last year, and have begun researching it this year, in between my other commitments. It's a controversial topic, and one which I'm sure has the potential to land me in trouble, but I'm drawn to it for a number of reasons which I will try to explain. For nearly a decade now, I've been working in and around the field of "wellbeing". Whilst I personally prefer to talk about "mental health", because my focus has been on exploring how we manage our minds and keep ourselves mentally healthy, wellbeing has been an inescapable and at times useful term in the development of Mindapples. The trouble with wellbeing is that, for all its utility in focussing people's minds on the softer side of debates, it is such a broad term that it can encompass many things which are a long way from science or medicine, or even mainstream research and public policy. From mindfulness meditation at one end, to prayer at the other, wellbeing and spiritual practices seem closely associated with wellbeing in the mind of the public. What's more, it hasn't escaped my notice that books like mine are often filed into the "Mind, body and spirit" section of the bookshop - leaving me to wonder, I know what "mind" and "body" mean, but what do book stockists mean by "spirit"? Are bookshops spiritually-minded? Does the publishing industry have a view on mind-body dualism? Do they believe in the eternal soul? Or - and this seems more likely - has the word "spirit" become a placeholder for something more complex? So there's that. And there is a health connection too. For many years I've been working to build an inclusive, grassroots conversation about the health of our minds through our campaigning work at Mindapples, and I have noticed that many of the parts of health and social care that focus on people's emotional and psychological wellbeing are closely aligned to the church, and spiritual practices more widely. From chaplains in hospitals to the NHS mentioning "spiritual health" in its strategy documents, spirituality is being used as a placeholder for many of the more intangible aspects of healthcare, and I think it deserves closer scrutiny. So the connection to my other work should I hope be clear: spirituality, like mental health and wellbeing, is an important component of how we can live well and treat each other better. So what do we need to do, if anything, to bring spirituality into the 21st Century? The first thing, I would argue, is to develop a secular view of spirituality, one which everyone can share. The term "secular", as I'm using it here, doesn't necessarily mean atheist or non-religious; by it, I mean I am seeking what spirituality means to people of all faiths and no faith, and trying to find some common ground on which we can all agree. The term as it is currently used can be so vague as to be actively unhelpful, creating spaces for fuzzy thinking and bad logic and causing us to talk at cross purposes on topics which I think demand focus and clarity, from healthcare to inter-faith dialogue. How are we to talk about the "spiritual insight" that the Cabinet Office says Bishops bring to the House of Lords, if we can't even agree what "spiritual" means? So my interest in this topic is first and foremost to bring clarity. I want to understand what people mean by spirituality, and start establishing some basic suggestions for how we could be using the word more accurately and effectively. In doing so, I hope to create a little more space for people to talk about the spiritual side of life without fear of being treated like a hippy or a zealot, and for science, healthcare and public policy to engage in this conversation in a way which is genuinely inclusive and not built on contentious and divisive claims about the nature of reality, whichever side of the debate they come from. I am also aware that these conversations are fraught with pitfalls, and writing as I am in the United States, I can already sense that it's a very different conversation to have here than it is in the predominantly secular UK. To talk about spirituality without the supernatural, or propose material alternatives to traditional religions, is in some ways to take sides in a long-running argument, and I don't know if that can be avoided. So for the sake of clarity, I can confirm that (a) I don't deny the existence of a supernatural dimension to the universe, but (b) I don't live as if there was one, and (c) I think if we do discover there is a spiritual dimension to the universe, this will be a wonderful breakthrough in science, and one to be celebrated and studied. So you can decide for yourselves which tribe that puts me into, if tribes are your thing. For my part, though, I'm mostly interested in listening at the moment. So let's start, as so many of my projects do, with a question: what does spirituality mean to you? How do you use the term, and what role does this word play in your life, if any? I would love to hear what you think about all this in the comments below, whoever you are. And be nice please: it's good for the soul. For those of us of a certain age, and particularly certain musical tastes, 2016 has been a year of surprising deaths. Harper Lee was the one that really hit me first. To Kill a Mockingbird changed how I saw the world, and Atticus Finch was my childhood idol. Then so many of us were sad to lose David Bowie, though I mainly felt a joy at what a splendid life he had led. And I had only just started writing this post in tribute to one of my writing heroes, Victoria Wood, when I heard of the sad death of the artist formerly known as Prince. Many of the people who have inspired me aren't around any more now. Bill Hicks, Christopher Hitchens, Carl Sagan, Ian Dury, to name just a few who passed away in my lifetime, and many more (Nick Drake, George Orwell, Richard Feynman, Lenny Bruce) who died before I was born. A sign of age perhaps, or as a friend of mine said recently, a cue that we need to step up and be brilliant now. No more looking to our heroes to do it for us. Victoria Wood had a special place in my heart though, and her death has continued to sit on my mind, so much so that I have a need to write some of it down, as a record of why she was so important to me and why I think her work matters. As I turn my attention more seriously towards writing as a profession, I find my admiration for other, better writers is growing. The more I grapple to find the right words in my own work, the more I find myself humbled by the words of other writers, and even more acutely aware of the hard work that goes into writing something truthful, beautiful and memorable. Now she's gone, I realise that of all the comedy writers I've admired, Victoria Wood stands out, for reasons which I've not entirely unpacked yet. Perhaps it was her versatility. I grew up listening to her stand up routines, and she taught me what a real variety act could be, blending characters, observations, asides, music and whimsy into a surprisingly powerful package. Her delivery was immaculate. No-one could get as many laughs as she could from a line as simple as "He's taking me to a creperie" or the word "Kimberly". Her confidence as a performer, a confidence in her words and how they should be heard, was always there from the very beginning of her career. As a child I watched her series of short TV plays, sadly rarely shown now, over and over again, admiring the variety of settings she could master, the detail of the characters, the killer lines hiding discreetly in the scripts. The awful package holiday travellers of "We'd Quite Like to Apologise"; putting the hell in health farm in "Mens Sana in Thingummy Doodah"; flailing around in a countryside full of yuppies in "Val De Ree (Ha Ha Ha Ha Ha)". They weren't sitcoms - though she showed with Dinnerladies that she could do that too - but true comic plays in the mould of the greatest television comedy writers. They only made six though. She mastered the form, and moved on. As she put it: "I'm always trying to change what I do, and make it different." Perhaps it was her heart that I admired. Sometimes her work could stray into sentiment, but the affection was always there to see in her writing. From her first appearance on New Faces you could see the wry smile and strong sense of place and people, and a genuine, big-hearted attempt to share something and be understood. I have a lot of time for biting satire, but I admired that she didn't need to be cruel to be funny. She reminded us that comedy isn't just about mocking people; it's about understanding people. The old couple sat in their car at the seaside, suddenly transported to the Taj Mahal ("well it's quite nice but I think it would look better with a tax disc and two windscreen wipers"); the girls on their big night out; her "friend" Kimberly who's "really really tall". Real people, talking in almost real language about boring, silly, normal things. Her writing was grounded in the strangeness and loneliness of being a person. The hope and the pathos of time passing, people stuck in ruts, watching their lives happen to them. "My life seems completely grey, bleak and pointless," says one man. "Yes, well, sometimes that's God's way of getting you to enjoy Gardener's World," comes the reply. This is comedy about people, for people. She wasn't trying to look clever; she was trying to share what she'd noticed, in the hope we'd noticed it too. "There's no exclusivity in her humour, but it's not dumbed down either," and Johnny Vegas once put it. She listened to people, and that made her writing so much more acute and truthful. She listened to people, because she cared about people. Perhaps it's a northern thing. I was in Huddersfield the day she died, and it was a timely reminder of her Prestwich origins, the "northernness" in her work that is hard to define and even harder to ignore. She once said that it was very important for her to be from somewhere, and her rootedness was part of what made her work so accessible. Everyone's from somewhere, after all. It's hard to imagine now that she was criticised early in her career for being "too Northern". When her character in Pat and Margaret is described as "an overweight northern waitress with all the sophisticated allure of an airline salad," it's clear snobbery was all too familiar to her. She wasn't saccharine about her roots, but she carried them with her - and she respected her culture enough to give it a good kicking. I suspect it will be her deftness with dialogue that will be remembered. So many of her lines straddled the mundane and the ridiculous. She could mock the innocent stupidity of youth ("Where are you in the menstrual cycle?" "Um, Taurus.") or equally pinpoint the detachment of the upper classes ("You see those big brown things outside..." "Trees?" "That's it."). Nobody could escape her magnificent ear. The missed meanings, the silliness, the sense that someone, somewhere, has probably said that. This is reality, ever so slightly exaggerated, and all the more unsettling for being so very nearly normal. Her lines can't be stolen because they are so completely hers. She showed that there is comedy in every detail, if you just listen properly. The one-liners and the sketches will circulate for a long time, perhaps forever. Two soups, hens in the skirting board, Mrs Overall, Kimberly - these are part of British comedy history now, and are unlikely to be forgotten. Most of all, though, it's her work rate that I admired. Many years ago, I heard Stephen Fry present a Women in Film and Television award to Emma Thompson, and I've never forgotten what he said in his introduction for her, that she had "a natural born genius for bloody hard work". Victoria Wood was a writer in that mould. Her work rate was so high that her scripts were as close to perfect as anyone could get them, every word sweated over, every moment carefully chosen. The precision of her writing, the economy of her words, the musicality of her pacing; PG Wodehouse would have been proud of many of her comic lines, and there is no higher praise than that for a comedy writer. As Andrew Dunn put it, "she crams so much into her scripts, every episode you could watch two or three times before you've realised everything that's in it." So that's what I got from her. A realisation that being as good as Victoria Wood means working as bloody hard as Victoria Wood. And even then, I still won't be as good. She will be missed. She can still sing us a song, though, to help us cope with 2016, the year of surprising celebrity deaths. Here's to life, whatever the hell it's about. This week I was at the British Library for the CMI's Management Book of the Year Awards. A Mind for Business was shortlisted in the 'Commuter's Read' category, for books which presented important information in easily-digestible forms. Sadly it didn't win, but I was delighted to be part of it, and particularly since the category choice reflected well on the hard work myself and illustrator Owen Tozer had put in on the illustrations and visual presentation of the book. I was also very proud to be shortlisted alongside the excellent Jo Owen, whose work has been such an inspiration to me. The overall event was interesting. I'm not a huge fan of business academia - my encounters with business schools has mostly left me feeling they lack contact with the real world and are obsessed with making new theoretical models - but there were some intriguing books listed. The winner was Frugal Innovation, and co-author Jaideep Prabhu struck me as a very impressive man, and thorough in his approach. It may say something about the current state of the business world that the winning book was about doing more with less (a mantra of many of my clients these past few years), just as it may be significant that all but one of their management articles of the year were about change and uncertainty. Nevertheless, it's easy to forget just how much hard work goes into developing and informing managers in modern business - and just how many business books are written each year. So thanks to the judges for reading my book and for granting it a lovely Management Gold five star award (and for the stickers! ), and I'll get working to see if I can take home the big prize next time. I have been avoiding the commentary in the aftermath of last week's UK elections. The crowing triumphalism on one side, and the unfocussed rage on the other, have been too much for my hangover to bear. Take a breath, Britain, and let's think about this properly. Now that things are calming down a bit though (or descending into depression in the case of my friends who either work in or rely upon public services) certain questions are popping into focus. Does anyone know how opinion polls work? How did Labour manage to get rid of Ed Balls and still feel miserable? Did Scotland just hate Alex Salmond? And why on earth was Ed Miliband carving abstract platitudes onto a massive rock? We may never know the answers to these questions. Sometimes you've just got to let those hard to reach conclusions go. Yet I did read a couple of particularly interesting pieces this week that merit further debate. My friend Dougald's 18 points were far more eloquent and thought-provoking than I could have managed on five hours sleep, whilst the piece he cites by Paul Mason left me pondering tribalism and how we decide who is 'in' and who is 'out' of our political group. So as part of my rehabilitation back into society, I want to reflect a little on some of their points, and what I think last week might mean for our strange country, its strange politics, and the strange things we might have to do to thrive in them. Scotland is obviously the big story from last week. The warm south of Scandinavia may be heading out of the UK after all - and with a one-party state, apparently - even if last year's referendum had appeared to close the question. What interests me more, though, is where this leaves England. I have long thought that meaningful devolution of power to the nations must involve an English Assembly. Its absence leaves England the de facto ruler of the UK (since its assembly is the superior one), leaves Scottish MPs deciding on English affairs and makes the voting process an even messier mix of local, national and global concerns than it was already. The problem though is that devolving English rule to London does nothing to address the growing divide between the people in the South East - the diaspora of the financial markets - and the rest of England. Small business owners aside, the politics of these groups is disparate at best, and the growing divide between haves and have nots will never be bridged by that tried and tested panacea of economic growth. Appealing to people who want business as usual and people who want to rip up the system and start again is becoming increasingly untenable, and it may only be a matter of time before Labour sees the rise of its own UKIP equivalent in the north or west of the country. Tory support is always strong in England and that was enough to see David Cameron across the line, but Ed Miliband's set-in-stone promise of "a strong economic foundation" was hardly the concrete (forgive the pun) message needed to mobilise the Government's opponents. The Labour Party's messages have had the feel of being written by committee, of a ham-fisted attempt to appeal to both sides of the debate. On the other side, the Conservatives are soon to be sidetracked by Europe for two years, and UKIP remain a useful protest vote that more Euro-sceptical followers can use to force their hand. The Scottish question might be the least of our worries. Are we in danger of falling into tribalism, or worse, withdrawing from discourse altogether because we fear what would happen if we told each other the truth? Is the UK part of Europe, or is it just London? Where is the common interest that can bring England together, let alone the UK? One of the most peculiar things about watching the results come in last week was how many different directions voters seemed to scatter from the Lib Dem sinking ship. We could expect the party of the centre to lose votes to both Labour and Tory, but many went to UKIP and some to the Greens too, suggesting the spread of views in their base was so wide as to be almost incoherent. As Dougald puts it, the party looks now to have been "a depository for vague dissatisfaction of a variety of flavours, whose raison d’etre disintegrated when they became an adjunct to the Tories." They have passionate supporters of course, and they certainly try to stand for much more than that. Yet so many years as the third party may have left them mistaking protest votes and tactical switches for loyal support. Just as I suspect radical parties would struggle more than they expected in a system where all votes were counted, so the Lib Dems may have seemed a more appealing prospect outside government than they were in it. Once a moderating force on both Labour and Tory excesses, what can they stand for now that their left-wing credentials are soiled with crude austerity measures, and the moderate right are happy to vote for David Cameron? And do we even need a centre party when the other main parties now seem to agree on so much? The Labour Party stopped being the party of factory workers a long time ago, but they still struggle to represent owners and workers together in their business policies. In an age of self-employment, portfolio careers and decent employment legislation, class war politics feels antiquated, yet the two main parties are funded along these lines: Labour by the unions, and the Conservatives by wealthy business donors. This leaves them fighting a battle neither can win, or scrapping over abstract concepts like compassion, prudence and courage, with very little genuine evidence changing hands at all. We might still see the emergence of a UKIP style opposition party on the left, opposing austerity and standing up for monetary reform, but there are two obstacles to this: firstly, the lack of funding for a party genuinely representing the poor and vulnerable, and secondly, the awful outdated language of the old left, obsessed as it tends to be with class and power. Saying "give us the money" is not a political position, particularly when it is accompanied by accusations of conspiracy and cruelty. Instead, the left needs to find a language for talking about Britain in business-like terms, that makes a case for investing in infrastructure and bringing the poorest and most excluded along on the journey. For many, Labour is associated with people who receive money, and it doesn't make a strong enough case that employers and staff can only make money together. As our society blurs those boundaries, and globalisation leaves us all on the managerial side of a continental outsourcing project, both Labour and Tory need a new script. Their opponents need to find a new funding model, and a better way to talk to the electorate. It says a lot about the failure of our current political discourse that an obvious joke can end up being taken seriously by so many people. The other point to be made, particularly on a blog that is at least nominally about technology, is that old-fashioned technologies still dominate our politics. The nation state is under threat and UK politics is stranger than it has been in decades, but the driving forces are still tribalism and self-interest, whatever our good intentions. Social media has helped us engage more in the campaigns - don't forget just how difficult it was to hear public voices in TV-led election campaigns even ten years ago, compared to the Twitter-focussed media of today - but it hasn't helped us change the system yet. Dougald is right that we need to do more to engage the grassroots in meaningful conversations, and that social media has become an exclusive club in the eyes of many. The question is whether there are better ways to do that now than there were a decade ago. We still have an electoral system founded on the principle that it takes a long time to ride to London on horseback. Perhaps we can do something altogether more interesting now. Or perhaps democracy needs to move as slowly as its slowest citizen or risk losing its purpose. As we head towards five more years of Conservative rule - still with the slenderest of mandates for such a radical government - our nation feels more divided than ever. On one side, many people want a streamlined libertarian state delivering in more efficient ways and providing opportunity for those who are willing and able to take it; on the other, as many people want a Scandinavian-style social project to invest in our national infrastructure, ensure fair treatment for all and play an active role in our global neighbourhood; and many people want a complex combination of both. Serving the needs of all these people, and keeping them all within the democratic congregation, is becoming an impossible task. We must try though, or else we will continue to alienate the poorer and less fortunate parts of society, divide our nation and be left facing problems which our current toolset can't really answer. How much hope I have of the current regime to do that though, I'm afraid I can't really say. With Michael Gove wielding the hangman's noose over the Human Rights Act, and further cuts in the pipeline, the future looks fractious, and politics angry for a few years to come. Let's just hope the resulting battles are physically peaceful and intellectually dangerous, rather than the other way around. Another year, another blog upgrade. Yes I have taken the plunge into the mobile-first generation and switched www.sociability.org.uk to the juggernaut that is Squarespace. It's taken me quite a bit of getting used to, but it does look lovely on a tiny screen, which is how all the best websites need to be these days. Aside from the platform though, there are a few other changes at Sociability this month. I'm writing this from the rainy south coast where I'd been holed up for much of last year writing my latest book, A Mind for Business (available in all fine bookshops and makes a lovely gift, hint hint). Having spent most of 2014 writing a book, I've been struck by just how rarely I'm posting on this blog, and trying to work out whether that's just because I've been busy, or because there's something not quite right about it. My conclusion, such as I have one, is that the problem was that my posts back then weren't actually very interesting. I was writing about social media, which frankly hasn't really interested me so much since it got taken over by advertisers and Taylor Swift. Not that I have anything against dear old T-Swizzle, mind. It's just that when I was working on School of Everything and co-writing Social by Social, technology seemed to be the new frontier. Now, I look at the torrent of new dating sites and micro-blogging tools and wonder where the new frontier went after all. Even more worryingly, I look at the hacking and slashing of public services that now lurks behind the 'radical disruption' banner, and wonder just where the invisible revolution we were promising a few years ago has actually ended up. No wonder, then, that I haven't been feeling very inspired to blog about technology lately. So I think it's time I wrote about the things that actually are interesting me. After all, before we can be interesting, we must first be interested. And I am very interested. In so many things. Since starting Mindapples as a business in 2010, I've grown more and more interested in the workings of the human mind, and the emerging and chaotic findings of psychology and neuroscience. I am not so taken with the rather tedious attempts to apply all this amazing research to increasing sales or boosting 'efficiency', but I am interested in the human mind as a design consideration. I am interested in how understanding and harnessing our humanity can help us improve how we live and work, and what society would look like if we designed it around human nature rather than trying to change it all the time. In the lucky West, we live in a world increasingly dominated by technology that improves our lives, but it is often developed without a detailed consideration of what we need to thrive. Public services are built without thought to their emotional impact, and society is run on some quite archaic principles about human nature, from the myth of rational independent economic choice to a worrying overuse of eye-witness testimony. So here on Sociability I intend to write about other things I can't write about elsewhere: the effects of society on our minds and our wellbeing; the psychology behind some of the big political and social phenomena of our age; the essential ingredients of human nature that can be harnessed for good or channeled towards evil. In short, this blog is going to be about humanity, not technology. Or perhaps sometimes the intersection of the two. I will do my best to write for myself rather than for anyone else, and to write what I find interesting rather than what I think I should be saying. Let's see where that takes us, and if I have to rebrand the site again, so be it. After all, anything's better than being boring. Happy reading! So my new book, A Mind for Business, has recently been published by Pearson. Beyond the commercial and practical reasons for writing it, this book is actually rather important to me. Though my background over the past decade has been more in innovation and social change than the study of the mind, the subject of how our minds work has fascinated me of late, and has become the cornerstone of both the Mindapples campaign and the changes I want to see in the world. We have quite a good understanding of our bodies , but our minds are still, for the most part, the province of myths and hearsay, from throwaway comments about ‘brain chemistry’ to films about using 100 per cent of our brains. These misconceptions are mostly found in pub conversations and pop culture, but they seep into our everyday discourse to affect every aspect of how we live and work, from job interviews and GP visits to law courts and even public policy. Some of these inaccurate views – such as the economic assumption of independent, rational choices - are being challenged, but many more – the faith in eye-witness testimony for example, or the persistence of ‘left- and right- brain thinking’ – persist, influencing our choices and shaping our lives. These beliefs interfere with our ability to work effectively and manage people properly. They prevent us from realising our strengths or forgiving our weaknesses. They prevent us from understanding each other, and interfere with our relationships. The closest term for this in modern psychology is mentalisation – the ability to accurately assess what is happening in your mind, or in someone else’s mind, and relate that to behaviour. Our ability to understand our own mind and the minds of people around us directly affects the quality of our life and work - and more importantly, it is a skill which can be taught and learnt. So my purpose in writing this book is to dispel the old, inaccurate views of our minds, and replace them with models that work better. By presenting an overview of the most robust, evidence-based models currently on offer, I hope to help us all understand ourselves and each other better, to work smarter, feel calmer, and get along better. The findings collected have certainly helped me, my colleagues at Mindapples, and the participants in our training sessions, and I hope through the book they will help us collectively as a society too. Models are never perfect of course, and they are rarely finished. We are a long way from being able to make perfect predictions about human behaviour, and perhaps we should be grateful for that. But we all need models, and we use them unavoidably and habitually to make thousands of assumptions about ourselves and others every day – and so I think we should try to make those assumptions as accurate and useful as possible. I hope this book can contribute to this process of discovering ourselves and others, and help us all harness our minds more effectively, and improve how we live and work. For the past few years I've spent my professional career developing new organisations that deliver public benefit, and for the past four years in particular I have spent my time developing and raising money for my current enterprise, Mindapples, which aims to inspire and support everyone to take better care of their minds. Over my time developing Mindapples, I have met many funders and written many funding proposals. Some have been successful, most have not. I have heard a lot of feedback on my work, and had a lot of conversations about what people want to fund, how to measure success, the need for sustainability, which company structures are best, and so on. Throughout this I have been struck by two recurring themes: firstly, that the people who are most complimentary about what I'm doing usually aren't the people who actually support us. Every time you add an eligibility condition to your fund, you create a barrier to innovation. Good ideas come from anywhere, and if you specify where they have to come from, you miss most of the best ones. Give up on the notion of bureaucratic systems to identify innovation, and start making decisions based on your assessment of the actual project and social need. Once upon a time I was amazed by how little funders seemed to know about the markets they invested in. However, now I've learnt more about how VC firms operate, I'm actually much less surprised than I was, because doing the level of research an average VC expects would cripple most grant funders. Unlike the private sector, they are spread too thin. Whilst commercial firms tend to specialise in particular verticals like clean tech or education, Organisations that fund 'innovation', for example, find themselves bombarded by bids from healthcare, microfinance, education, youth engagement, prison reform, public service redesign and so on. Now ask yourself: how many organisations do you know who are experts in all these areas? The alternative is that they rely on applicants to tell them about the market, by asking them who their competitors are, what their research base is, how they prove the social need, and so on. If funders are going to really get to grips with an issue, they need to do their homework, and that means being embedded in the sector they are trying to change, not just parachuting into it and claiming to be radical and disruptive. As a funder, you don't know as much about any market as the entrepreneurs and innovators on the ground. Any guess you make about what solutions are needed will be just that: a guess. It is very tempting to sit around in the office and come up with new projects, but you are just adding to the pile of untested ideas when there are already plenty of better, more developed ideas out there that haven't yet been put to the test. I have even had the experience of being told there wasn't enough evidence for the efficacy of my own projects, by funders who then went straight on to give larger grants to completely new ideas with no track record at all. Yes, of course sometimes there are new ways of doing things emerging that need to be tried, but chances are if you've thought of it, someone somewhere has done it, and maybe they need your help. Coming up with ideas is great fun, but try to resist the temptation. Instead, spend your time exploring the social issues facing us all, learning how and where they show up, and figuring out how to measure impact in those areas cheaply and reliably. Then be as open as possible to where the solutions might emerge. If you publish the goals in a clear enough way, you don't need to specify how they will be solved, and you may find that some existing ideas turn out to work brilliantly. What's more, you may find that your money is better spent helping promising ideas learn, improve and scale up, rather than feeding more innovations into a sector that is well known to have a big funding gap for promising early stage projects. Funders tend to move in packs. Whatever buzzword is flavour of the month - volunteering, sustainability, exercise, employability - you will tend to find a number of funds focussing on it at the same time. The result is that funders specialise in areas that already have plenty of money, and neglect areas where they could have a big impact. Think, for example, how many volunteering projects were funded in 2011-12, and how few mental health projects; yet wind the clock forward, and young people's mental health is flavour of the month and volunteering has had its turn. Strangely though, this clustering doesn't seem to result in genuine collaboration between funders or the projects they support. Very often we hear stories of two near-identical projects being funded simultaneously, and both then struggling for sustainability. So question your assumptions, ask yourself why you picked these themes rather than others, and check your prejudices at the door, because I assure you that you have them. Find out where other funders are putting their money. If you want to follow them into the same markets, do it strategically and try to support projects your peers have already found work. If you want to address areas of genuine need, look for the gaps in the current funding landscape and plug them. If you want to fund things that will be sustainable, it is not enough to give them a handout and then say "where's your sustainability plan?" If your goal is to create sustainable enterprises then you need to invest in a pipeline, help them find clients, teach them to sell, introduce them to follow-on capital, and do all the other things that commercial incubators do well. If you don't do these things, you are basically getting great projects started and then leaving them to die on the vine. Recognise too that sustainability is not always possible. Not everything that is worth doing has a business model, and not every social need has a corresponding market. If you want to create viable businesses, recognise that this means you will have to ignore most of the really challenging and important social issues of our time. If you want to tackle real social problems, accept that you or one of your peers needs to support these organisations to continue their work after your initial investment, otherwise you will just be adding to the set of projects that did wonderful work but then had to shut down because no-one would pay for the public benefit they created. Ok, everyone hates a know-it-all, and it's not nice to tell busy people how to do their job. In fact, that's often why funders and frontline innovators fall out in the first place. We're all busy, and we're all doing the best we can. So what do I know? But after nearly a decade in this space, I've found that an alarming number of funders fall into one or more of these traps, and that very often everyone is so busy they haven't even thought about it. In an under-resourced and over-burdened sector, it's easy to fall into simple traps and fail to notice you've done so. Over the past decade, I've met all kinds of amazing people in funding organisations, and worked with some brilliant funders. I've even been rejected by some brilliant funders who were quite right not to fund my half-baked idea. But I think a few small changes could make a big difference, and if we don't speak out when we think things could be better, then we really aren't our jobs right. Recently I gave a talk at Scanners' Night, a charming ideas and networking evening hosted by John Williams, author of Screw Work, Let's Play. After an initial chat about Mindapples, for the second half John and I tried an experimental discussion about "how to change the world" in which I shared a few of my tips for achieving social impact, based on my experiences of running social innovation projects and start-ups. It was really nice to have a chance to reflect on what I've learnt from School of Everything, Mindapples, Sociability and the RSA, and I was surprised by how different my approach is now compared to when I started. So in the interests of helping other people seeking to do something positive in the world, I thought I'd share my top five tips for social entrepreneurs and budding world-changers here. 1. Find the positive action that everyone around you wants to do, and help them do it. If you try to do everything yourself, you will run out of money first and energy second. Figure out what other people might do to contribute to your vision, and make it easy for them to do it. Perhaps if everyone did one small thing, or volunteered for your project in some small way, the world would change. Think, for example, how much easier it is to improve dental hygiene by getting every child in the world to brush their teeth, than by training up ten million oral hygienists. 2. Sell things to people for money. The biggest reason social projects don't make money is because they never ask anyone to pay them any money. This has two effects: they have no money, but also, and much more importantly, they never put themselves under pressure to deliver real value to their customers. The more you charge for something, the better it needs to be. Stop letting yourself off the hook, and instead challenge yourself to put a value on what you offer and then make good on it. Even if you end up giving things away later, the quality of your work will be so much better for it. 3. Make people's lives easier. It can be tempting to enroll people to your cause by explaining how hard everything is and how much you need help, but the best projects are a joy to help. Make it easier for your customers and beneficiaries by providing a service they can't live without, and make it easier for influencers and investors by giving them the solution as well as the problem. You don't have to have everything worked out, but nothing is more demoralising than feeling a task is impossible. You will often be told that you need to be ruthless to succeed, but in my experience unpleasant people burn their bridges and quickly run out of favours. Yes, you need to make tough decisions, and yes you can't be generous and forgiving about everything and still have any integrity or quality standards. But - and it's an important but - there is no advantage to being nasty, and no reason to be unpleasant even if you need to be firm. Be nice, and be kind, because people notice, and people are the best asset you can ever have. Ok, so perhaps not the most obvious point, but beauty can get neglected in the quest for a better future. People remember people and projects that delight them. From being well presented in a meeting to having a really charming website, don't underestimate the value of good looks and charm. Many a contentious project made it through because someone was just too charming to turn down. Of course, these are just a few thoughts that emerged on the night, and lists like this can be cut many ways. These things have worked for me though, at least in small ways, and I can certainly say I achieve more and do more good by following these principles than I did a few years ago. So I offer you that, for what it's worth. If you start a start-up, lots of people will try to give you advice, but I'm usually more interested in asking questions. If you've founded a new business, I doubt anyone knows more about your vision than you do. The right investor or consultant may know the specific market you are operating in better than you, but they certainly won't know where you want to take your business except from what you tell them. So I think the art of helping the founder of a start-up lies in asking great questions, to tease out exactly what that vision is, and whether it makes sense. I've been asked hundreds of questions about my start-ups over the years, usually by prospective investors and funders. They range from pithy quips like "what's in it for me then?" through to intensely complicated invitations to explain my theory of change or articulate my five year growth model in 500 words or less. I've been recommended loads of books that claim to have figured out the three/four/six/nine steps for create a compelling business proposition. I have spent several years now feeling incredibly confused about all this. 1. Who pays you money and why? Unless you know who you're invoicing and what to write on the invoice, you don't have a business. 2. How much money will they spend with you? Delivering amazing benefits to a handful of impoverished people won't make a business. 3. How much will this idea cost to make and sell? If this idea costs more money to make and sell than people have to spend on it, you should expect to lose money. 4. What do you own? If your business doesn't have anything - great staff, famous brand, key relationships, IP rights, infrastructure - then anyone can do what you're doing and you don't need a business to do it. Build around your core assets and what they make possible. If you can answer each of these questions in one sentence, and mean it, you just might have a business. Not everyone is at that stage of course. It can be a little crushing to ask a bright-eyed young entrepreneur all these questions, because most of us start out with a little intuition and a lot of hope. Every business needs to bring benefit to someone - solving a problem, helping them do something, creating an experience - and that's where it all starts, even if we don't have all the answers just yet. 5. what incredible benefit can you give your customers? If you didn't bother doing your business, who would miss out? What wouldn't they be able to do? Why does that matter? 6. Is that benefit worth paying for? There are many problems to be solved in the world. Most of them are worth solving. Many of them people would like solved. A few, people will invest their own money in getting solved. That last bit is business. Everything else is philanthropy. It's a nice piece and I think Scott's list is very useful for anyone starting out on an entrepreneurial career. It occured to me that it might be worth writing another list for "social entrepreneurs". The normal lessons of business obviously apply to anyone seeking to use it to improve society, but there are a few particular pitfalls that I have noticed social entrepreneurs seem to fall into more often than their commercial brothers and sisters. So here are my top four mistakes, in my experience, that first-time social entrepreneurs make. Looking for funding rather than looking for business. Most social entrepreneurs aren't doing it for the money. Unfortunately that means they often spend far too long trying to win the approval of influential people like funders and journalists when they should be working. If your idea of success is getting investment, no-one should invest in you. If your idea of success is to be self-sufficient so you can put your next plan into action, then you might actually get somewhere. Thinking you know better than your customer. If commercial entrepreneurs start by identifying something that people want to buy, social entrepreneurs sometimes start with the opposite: a desire to get people to buy something they currently don't. There are far too many "shoulds" in social sales pitches. Remember that if you want to be a business, you need to sell what the customer wants, not what you'd like them to want. Do business in the world as it is, not how you'd like it to be. Overestimating the market. Most social entrepreneurs think they've spotted a niche that no-one has ever seen before, but in many cases the market they have spotted is either hard to profit from or just not ready yet. A lack of competitors can be a sign that you're missing something. If you are years ahead of your time, be realistic about how much time and money you'll need to reach profitability, and how many new competitors you'll have when the time finally comes. Taking too long to issue the first invoice. Business is about selling things to people for money. If you aren't doing that, you are just preparing to do business. The quicker someone pays you money for something you've done, the quicker you know what line of business you're really in. Questions of organisational structure, financial planning, marketing and scalability only matter once you have figured out how to make money. None of this is rocket science. And let's face it, most of us have made these at one time or another. But as a wise man once said, the trick of life isn't to learn from your own mistakes: any idiot can do that. The trick is to learn from other people's. "Don't be afraid of bronze." How do we tackle inequality and exclusion? How do we have high quality but affordable public services? How do we provide dignity and care for an aging population? How do we modernise our infrastructure? How do we stabilise our economy? As we plough through Party Conference season, questions like these are perplexing our leaders and policy researchers as we struggle collectively to see a route to a stable and thriving society. What you will notice, though, is how rarely these problems are tackled head-on by leaders. They will talk about the things they believe in, and their desire to tackle the tough problems facing our country, but the solutions they then propose seem to be so much smaller in scope and limited in impact. Too often it seems that the problems exist on a much bigger scale than the tools and techniques we have to solve them. Last month though, Matthew Taylor of the RSA outlined an interesting framework for approaching such problems in his Chief Executive's Annual Lecture. hierarchical authority - "I'll do what I'm told"
social solidarity - "I'll do what everyone else is doing"
individual aspiration - "I'll do what I want"
All three are fundamental to our nature as human beings, but the balance between them has changed considerably over the last century. Hierarchy has been enfeebled, by our loss of faith in our leaders and institutions, and by the social technologies that now enable us to mobilise against them. Our trust in strangers and solidarity with our neighbours has been stretched by increased social diversity, the fracturing of the class system and growing social inequality. Of the three, individualism is now the strongest, but it has become narrow and materialistic, undermined by the inefficacy of markets to organise our needs, and by the lack of strong hierarchy and social solidarity to restrain it. The result is a growing fatalism about problems that cannot be solved through individualism alone - problems like climate change, the pensions crisis and the economy. Our leaders proclaim bold rhetoric designed to appeal to our other social drivers, such as the appeal for solidarity in the "Big Society" movement, but the solutions they propose don't match the rhetoric. We are not creating the kinds of solutions that can tackle our problems, Matthew argues, because we are not designing solutions which make use of all the sources of our social power. To solve our biggest social problems, we must build up the strength of all three of these social drivers, and harness them together to create solutions that involve everyone. And he argues that to do so, we need a design mindset, not a policy one. We have often heard governments in recent decades saying that growth is good for everyone. Never mind wasting precious resources on panaceas for the impoverished, they say, we need to pump prime business and jump-start the economy. Invest in growth, so the argument goes, and the standard of living will rise for everyone. A report today though seems to confirm what many of us already suspected, that economic growth does not benefit everyone after all. At this delicate moment of cuts, this news is troubling for those of us who are already worried about the inequalities dividing us from our neighbours, or who are simply unlucky enough to be in the poorer half of society. The Gardencentreshopping href="http://www.resolutionfoundation.org/publications/who-gains-growth-living-standards-2020/" target="_blank">Resolution Foundation's Who Gains from Growth? report, published today with Warwick University and the Institute for Fiscal Studies, predicts that the lowest income families in Britain stand to lose 15 per cent of their incomes by 2020. Middle-income families will also lose out in the long-term, with only the wealthy standing to gain materially from economic recovery. all working-age households below middle income in 2020 will be worse off than those in the same position a decade earlier. A household at the bottom of the low to middle income group1 in 2008-2009 had an income of £10,600 a year. By 2020-2021, under the baseline, the income of a household in that position falls to £9,000 a year (in 2008/09 prices), a real terms decline of 15 percent. A household at the top of the low to middle income group would, in the same position, see its income drop from £23,000 per year in 2008-2009 to £22,200 in 2020-2021, a real terms fall of three per cent. What is particularly troubling is that, as the report itself says, "all the projections in this report rest on GDP forecasts of modest growth to 2015 and of annual average growth of 2.5 per cent from 2015-2020 which, by comparison to more recent forecasts, now look optimistic." In other words, even if the Government deliver what they promise on economic policy, most of us will still lose out. When I read this I was struck by its similarity to Professor Richard Florida's recent RSA President's Lecture. He argued that economic growth is now linked closely to the levels of creativity in our cities, and that nurturing the creative industries and high tech businesses such as in London's Tech City holds the key to making Britain internationally competitive. In the Q&A afterwards, I asked Richard about the implications of this for the job market. If our economy is increasingly based on creative, high tech businesses - ones that, for example, radically compete with traditional publishing businesses by cutting bookshops out of the loop and allowing authors to self-publish and sell direct - then what does this mean for the number and nature of jobs available in this new economy? His answer was sobering. He pointed to the growth in "personal services" - massage, personal shopping, pedicures - and suggested that this was the future growth area for the labour market. To his credit, he made the strong point that we need to make these roles creative and enjoyable for people, and ensure they provide a good standard of living, but I was still left feeling uneasy. Are we becoming a two-tier society, of the wealthy, tech-enabled "creative classes", and their servants? Some alternative scenarios – boosting low wages, improving skills or raising female employment - lead to modest improvements for those in the bottom half of the income distribution. However it is only when all three measures are combined that many people in the bottom half become substantially better off. Of course the report will have its critics and it needs to be submitted to rigorous review. What is clear though is that we need a much wider and more informed debate about growth than the stultifying "increase public spending" / "get Britain back on its feet" bun-fight that is currently dominating our political discourse. We need our Government to focus on getting every part of the economy back on its feet, particularly those who are suffering most right now. Because if we don't, we risk more and more people becoming disenfranchised in a system that simply doesn't allow them to win. September is here and the leaves are turning brown. As Philip Larkin once wrote, “begin afresh, afresh, afresh.” A time for renewal, perhaps. Sociability launched in 2007 in a very different environment to 2012. Back then I was part of a small but passionate movement to use “web 2.0” tools to reorganise our social systems, improve public services, connect people together and build the world we want to live in. Now civic responsibility has given way to economic reality, and unfortunately many of those that were leading this charge are now pursuing other strategies to survive in this leaner, meaner world. But Sociability has persisted, and so too have many of the projects and conversations we were part of five years ago. Being a network has made us more resilient to change, and many of the trends we were part of in 2007 have grown rather than receded. Three years on from our publication of Social by Social, the Arab Spring, Wikileaks and #Occupy mean everyone is now talking about the role social media is playing in social change. Four years on from starting Mindapples, the Government is now measuring our national wellbeing and there is more talk than ever about the centrality of mental health real venus factor reviews in public health. Two years on from the publication of Local by Social, the Big Society agenda and spending cuts have made collaborating with citizens a key part of the work of local authorities and public service organisations. Okay, so maybe we didn’t expect the Olympics to be quite as good as they turned out to be - but hey, we can’t get everything right. So as we enter our sixth year, with a revamped website and a new focus on social business and social technology, we hope that over the coming years we’ll continue to push boundaries and break new ground, and have some interesting conversations along the way. We hope that our new projects, Lock-in TV and Do a Bit, will turn out to be as prescient as our previous innovations, and that we can continue to help our clients adapt to an increasingly turbulent but also ever-more dynamic new global market. And most of all, we hope people will keep sharing their ideas with us and helping us learn more about the world we live in, and how to thrive in it. Expect to see a bit more blogging from me too. I’ve missed blogging. This afternoon I was at the Roundhouse in Camden for Business in the Community's "Communities Summit", courtesy of the Big Society Network, listening to Prince Charles and the Prime Minister issue a call-to-arms for British business to step up and take responsibility for the challenges facing the country. This felt like an important moment in the somewhat chequered history of the "Big Society" policy agenda, and also of the up-and-coming social enterprise movement. Essentially this was David Cameron's most decisive attempt yet to reboot the Big Society as something more tangible, turning it from a rather elusive and abstract policy of community involvement into a clarion call for business to support grassroots action in communities around Britain. It was useful to hear this new direction, primarily because the greater clarity it brings should finally make it possible for people to take action in support of the "Big Society" project - which, as I have said before, has been hard for many of us to get behind previously. But this clarity is also helpful because it names something which has often gone unsaid in the Big Society rhetoric, which is that if private funders and volunteers are to play a leading role in delivering our public institutions and improving communities, this will naturally mean private businesses - who are capable of mobilising far more money and manpower than any other sector of society - having a much greater say over the running of our society. Where I found myself in tune with this thinking was on the importance of businesses stepping up and taking responsibility for the impact they have on society. As David Cameron indicated today, the Government can do a lot to tackle the obesity crisis, but all its public health campaigns and NHS services will fail if corporate interest continues to make it harder to eat healthily than to eat unhealthily. All the nudges the Government can muster will still pale in comparison to the huge efforts spent by consumer brands to push people back the other way. Prince Charles, who I've always rather liked, bless him, also spoke very passionately about the opportunities that businesses have to make a positive impact on the world, and challenged all of us to do more to use our resources to do good. And he's right. Businesses have so many assets, and so many skills in delivering quality products at scale, that to point all that infrastructure solely at wealth creation seems like a wasted opportunity. Business in the Community's new "business connectors" programme is putting resources from major UK businesses like BT and Greggs on the ground, in communities, doing excellent work joining things up and making things happen. Of course there is a value to these corporate-sponsored projects to deliver value to communities and improve society, even if it is mostly felt by the people inside Government who are aware of just how much large-scale public services are starting to cost. But when Mr Cameron spoke out firmly in defence of the value of, for example, great schools run by banks, and workplace education placements delivered by supermarkets, I felt uncomfortable. So I was surprised when he questioned the motives of people, like me, who feel uncomfortable about such things. I felt it was disingenuous to suggest that anyone who is suspicious of corporate-backed social projects is some kind of snob, acting not in the public interest but according to a misplaced and rather grubby ideology. This attitude seems uncharacteristically dismissive of the natural vigilance that many people display over our civic institutions, always checking that our public institutions are being run in the interests of the people and not private interests, ensuring that democratic processes are followed, and championing the most vulnerable so that they are not left behind. When talking about the contribution business can make to improving society, we would do well to remember what private businesses are created to do, which is to maximise profits for their shareholders. I am a Director of two for-profit businesses, and that is my job, as laid down by statute: to make money, not for the wider community, but for the few people who are hard-working or fortunate enough to own shares. In some businesses, the beneficiaries are the staff, such as in partnerships or staff-owned co-operatives; in others it is the customers, such as in Industrial and Provident Societies; but for most, the beneficiaries are the shareholders. Not the public. Not society. Just a few private individuals within it. And that's fine. I'm quite happy to make money for my shareholders, if I can, particularly if they have taken risks with their own money to back businesses which I believe should exist in the world. What isn't fine is to pretend that the company structure we have built to do that work has any other higher purpose, or to criticise people who are suspicious when companies that are legally obliged to maximise profits for their owners claim to be interested in anything else. I can talk all I want about my desire to improve society, but when I go to a Board meeting I am bound by company law to put those considerations to one side and focus instead on growing the profits of the business. This is not purely a problem that affects for-profit companies. Just in case anyone thinks I am being an anti-business snob at this point, I should add that even non-profit businesses have their own agendas too, whether that's to serve a vulnerable minority or to champion a particular agenda. There is only one institution in this country that is legally obliged and institutionally accountable to act in the interests of all the people of this country, and that is the State. That's why we have a State. I know it is hard to argue with a well-intentioned project that is persuading private businesses pledge £750m over four years to good works in communities, and I don't wish to denigrate the excellent work that is taking place in the Corporate Responsibility world. The more businesses can be involved in the work of improving our society the better, because our businesses are part of our society just like anyone else. Bring it on guys, you are very welcome here. But I think it is just as important for us to have a strong "Fourth Estate" of journalists, scrutiny bodies and concerned citizens, a proud tradition of so-called "snobs" checking that if our public institutions are to be funded by private interests, they do not end up acting in them. To do anything less would be an admission that we can no longer afford democracy. Today I'm at the launch of Patchwork, the new service by Futuregov. Patchwork is a lightweight web app to help social services support people better, by bringing together information from within different services, and from individuals and families, and displaying it in a useful way for social workers. As an Associate of Futuregov, I've been following their progress on this project since the start and it's fantastic to see it finally launched. I've also been lucky enough to be part of the team capturing the learning from the project for NESTA so I thought it worth putting out a few thoughts on the project to explain why I think it really matters. The process has been long and involved, full of the kind of administrative and cultural challenges that I'm all too familiar with from attempting to bring Mindapples into the NHS. What's remarkable is that Futuregov and their dedicated commissioning partners in Litchfield District Council and elsewhere have steered it through without compromising on the initial vision, and all credit to them for managing to create something that works, rather than something that ticks the boxes. It doesn't look like normal Government IT systems: it feels easy, even pleasurable, to use and navigate, it's relatively frictionless, and design lead Ian Drysdale has worked hard to balance a user-centred design approach with the tight requirements of policy and legislation. Less like SAP, more like Facebook. The system is social in its architecture, mapping the relationships associated to a case first and making it possible to see the dozens of different agencies and individuals who are often working on each case, and to know who to ask when you want more information (always my preferred approach to knowledge management). It brings together information from every available source, including service users themselves, creating a much richer picture of people's needs and giving individuals and families a voice in the systems that support them, without requiring busy practitioners to enter data twice. The technology behind the snazzy design is solid, built using the latest tools of "web 2.0" commercial apps rather than the more rigid and old-fashioned platforms that usually characterise Government supplied systems, and particularly they have spent a long time tackling critical issues like data security and permissions. The delivery method, as a hosted web app using interoperable standards to draw service data together, is cost effective for councils and (after a little redevelopment work) should be easy for clients to deploy. Futuregov have been in the "social innovation" space alongside Sociability and many of our little network for a good few years now, and they're really starting to go places. It's tough to say why some businesses grow and thrive over others, but I think the key to Futuregov's success has been that their business model is actually quite traditional: they sell managed web apps to support public service delivery. What gives them the edge over their competitors is that they take a new-style social innovation approach to solve them together - putting out an open call for help at the start, facilitating practitioners and service users to design the tool together, adopting an agile and forward-thinking technical strategy, iterating and testing as they go. The problems they are solving - in this case, helping different divisions of public services to talk to each other - are recognised problems for which their clients have budget, and their innovative approach allows them to solve problems which their competitors cannot, and deliver products which are far than their often slow and complacent competitors in the public sector IT market. Put simply, they innovate in their own products and processes, but not in their business model. Clever people. Today, Futuregov have announced £280,000 in start-up funding to take the Patchwork forward and develop it for scale. Congratulations to Futuregov on this fantastic achievement, and also to Litchfield District Council, NESTA and all the other many people and organisations who have backed them from early on. It's great to see such a practical and passionate project making real headway towards improving public services and, hopefully, saving lives. Recently I posted 5 Big Society questions which I felt needed answering if I could endorse the project wholeheartedly. Yesterday the Times ran a front-page story about how the movement is in crisis because of lack of definition and popular and third sector support, and I'm afraid I now agree with Matthew Taylor's analysis here that "If the Big Society debate doesn’t get more substantive and granular quickly, it will feel like the only credible thing to do is knock the whole idea." I think this would be a great shame, since the Big Society project is creating a powerful space for new thinking to emerge and giving local government in particular a mandate for positive change and greater community engagement, all of which are good things. But to echo Matthew's sentiments, there is far to much unsupported assertion going on and not enough evidence or testable hypotheses, and I am further troubled by the regular dismissal of issues and counter-evidence as "naysaying" or "negativity", which is stifling debate in this area as many participants (including myself) try to act positive in the hope of being on the right side of funding decisions in the future. I agree that we must be positive and collaborative about coming up with the answers together. I also agree that most if not all of the new infrastructure to run the Big Society must come from entrepreneurial solutions rather than government (such as this interesting new crowdfunding platform). But when I hear people who are not social entrepreneurs telling me how the social enterprise sector works, or politicians making bold claims about how the obstacles which currently exist will magically disappear without any explanation of how this will happen or acknowledgement of the value in the existing systems, then I can't help feel we're heading for a political trainwreck. Last night I attended the RSA lecture with the generally impressive Sir Ronald Cohen, and asked him how we can ensure social enterprises can compete with commercial interests for lucrative government contracts, rather than picking up only the non-viable markets. His answer was hopeful rather than evidenced. He believes that social enterprises will win tenders because they are culturally better suited and have greater connections with their communities - but there is no evidence of this happening now, nor of a plan to shift the structure and culture of government procurement to make this more likely in the future. It's a nice story, but there was no acknowledgement the lack of capacity for social enterprises to deliver critical national services, the bureaucracy of government procurement which favours those with the money to spend on navigating the process, the innate conservatism and risk-aversion of the public sector, and most of all the difficulty of scaling the kind of community and cultural factors which supposedly give social enterprise the edge. The reality, I'm afraid, is of large organisations bidding for large contracts which small community groups cannot feasibly deliver, social entrepreneurs spending months in negotiations for money which then disappears, commercial, academic and charitable interests mining smaller projects for their ideas, a lack of core funding or capital investment to enable social enterprises to scale up to meet these challenges, and a continual persistence of the attitude that the main advantage of the social sector is that we're really, really cheap. All soluble problems, but what are we going to do about them? Fix government procurement Government currently awards large contracts to large corporations on the basis of efficient delivery of often dated and ineffective solutions designed in advance by bureaucrats who are not directly connected to the problem they are trying to solve. Social impact bonds point the way to a public procurement model that is based on outcomes and allows innovative providers to pocket some of the cost-savings for game-changing innovations, and if it works it could be mainlined into all government procurement. But the only way we will create a sustainable social sector is if social organisations are given preferential treatment in procurement, either by forcing all bidders to have a voluntary element to their bid (forcing the Capitas and PWCs of this world immediately into partnership with voluntary groups), or by giving preference in contract awards to recipients of Big Society Bank investments. Build better corporate structures Current vehicles for social enterprise are not fit for purpose: they don't provide enough rigor to allow the charities commission to provide tax breaks, but also don't provide the equity return for either capital investors or social entrepreneurs. We need a new model which sits in the for-profit sector but with certain conditions, for example a restriction on what proportion of profits can be given as dividends or when they can be withdrawn, a cap on salary distance between best-paid and worst-paid staff, or incorporation of charitable objectives in the responsibilities of Directors. Currently, social enterprises need a non-profit vehicle to own the assets and protect the mission (and in the case of Mindapples, to give proper ownership and accountability to the community), a charity to get the tax-breaks, and a trading arm to offer a return to founders and investors. It's time to create a new integrated social enterprise vehicle that is fit for purpose, and for the government to offer hard financial incentives to philanthropists and investors to put money into the social enterprise sector. Make private enterprise accountable Banks and other high-yield for-profit entities do not, by their very definition, act in the interests of the whole population, but of the few. Private companies (and I speak as a Director of one) are duty-bound to act in the commercial interests of their shareholders, to the exclusion of wider social considerations. The result is a twofold madness: firstly, businesses prioritise the financial interests of their staff and shareholders over the improvement of the society those individuals live in, making us all richer in a poorer world, insulated from growing social problems by our similarly growing bank balances. Secondly, the full financial impact of businesses do not need to be considered by those taking the key decisions. The wider social impact of business remains an externality to the business transactions, something to be picked up by the government and the social sector in the form of, for example, massive recyling bills for processing excessive supermarket packaging, or social issues caused by low wages and redundancies. We cannot persist with a social model in which the public and third sectors perform palliative care to minimise the social impact of the private sector's actions, and must beg for corporate donations to do it. A gentle solution would be to legislate that all shareholders must vote and publish the social objectives for their organisation, and make Directors legally-bound to fulfil these obligations. This at least would force companies either to be bound by their supposed CSR commitments, or to come out publicly and say they are only interested in profit. A harder approach though is that if social impact bonds can be used to create positive incentives for social providers, they can also be used to create negative penalities for making problems worse. If every time Sainsbury's cost the local council large recyling bills, they were forced to pay a social impact bond that went towards paying public and social sector providers to fix the problem, they would soon think twice about whether their scotch eggs really needed those little trays. Invest in infrastructure We need to create the support structures and platforms to enable social enterprises to work and scale more effectively, which means we need a new fund (or a refocussing of existing resources) on infrastructure projects. If the government invested in infrastructure that the social sector could use, rather than trying to own systems and procure services not just for itself but for individual units of government, if you quickly give social and community groups the tools to reach considerable impact without needing investment. We need tools for organising volunteering activity, crowdfunding and donations, marketing and communications, accounting and payroll, recruitment, training and collaboration. We need spaces to work, better equipment, business advice, legal support, assistance with social impact (more on that below), CRB checks, accreditations, partnerships, access to capital and loan finance, tax incentives, support taking ideas abroad, and an array of other conditions and environmental factors for growth. All of these things cost money, but all of them are cheaper than the public sector's current tendancy to buy the same services over and over again for itself and refuse to share. Let's invest now in a shared infrastructure for public and voluntary sector partnership and start building this sector properly. Invest in evaluation and learning Most social enterprises and community groups know they are doing good because their communities tell them so, but they lack the resources to conduct rigorous evaluation or put their learning into a format that government or funders understand. If the Big Society Bank and the public sector generally is looking to the social sector to solve its problems, it needs to support innovative companies to understand what they are good at and where they fit into the government's priorities. It's all very well creating a social impact bond around a set of outcomes (for example, patient health indicators), but many of the most community-led and innovative organisations will simply not be able to prove that they can deliver on these metrics without spending heavily on feasibility studies and evaluation reports. Instead, the public sector should treat the social sector as its R&D department, and invest its own money (perhaps as part of the support infrastructure of the Big Society Bank) in scanning the sector, identifying and evaluating possible innovations, and working with social sector partners to share the IP created and take the best elements to scale. If it is up to bidders to prove why they can deliver on social impact bonds, the people best placed to do that will be Capita, PWC and other major corporate players who have the resources to do their own R&D and invest heavily in their own growth. And you can bet they'll be looking very closely at what they can learn from the social sector. Most of all, what the Big Society needs is an accountable design process for the project, in which all of us can participate in the debate about what is needed, what can be done, and who is responsible for making it happen. There are many things the government can do to help make the Big Society happen, but they need to listen to all the people involved, both online and via local community networks, and work with us to solve these problems, either by taking action themselves or giving their backing to others to do what is needed. Unless we have an open, critical debate about the practical steps needed, facilitated by democratically-accountable institutions and conducted in a transparent and constructive way, the whole project is in danger of becoming nothing more than a small handful of people sat in closed rooms telling stories about how everything is getting better, while outside things go from bad to worse. "Radio 3 is currently looking for "a new generation of public intellectuals". You can apply here - except that to be eligible, you must be studying or working inside a university. Now, call me self-interested, but by this criterion, the likes of John Berger or a young Karl Polanyi would fall through their net. I'm not comparing myself to those remarkable men. But as someone whose work gets cited by academics in a range of disciplines and is, I hope, beginning to make some impression in the public sphere, I'm disappointed to be excluded from consideration. This isn't just about me, though - there's a whole network of people I'm aware of in the UK and beyond who are doing substantial new thinking from outside of academia - often in close and constructive dialogue with those operating from inside university departments. The way Radio 3 and the AHRC are approaching this project is going to miss out on a huge amount of the emerging intellectual culture of our generation - many of whose brightest minds saw what was happening to academia and chose to do our thinking elsewhere. I've written to Roger Wright, the controller of Radio 3, telling him this and inviting him to redress the balance. To help him, I'd like you to nominate your own choice of "new public thinkers" from outside of the university walls." It's a compelling argument, and one which I wholeheartedly support. I have nothing against the academic world, having worked with many academics over the years including on Social by Social, but ever since my School of Everything days I have been convinced of the importance of breaking learning out of institutions and embedding it into society, and of the huge intellectual value created outside the academic world. And as one commenter pointed out, it seems odd that Radio 3's criteria would actually exclude Antonio Gramsci, inventor of the term "public intellectual". Dougald himself - obviously I should return the favour, but over many years of collaborating with Dougald he's been consistently years ahead of public discourse, introducing me to Ivan Illich when we were dreaming up School of Everything, writing about economic collapse long before the mainstream had the courage to do so, and creating new models for living and working which I believe will help shape the future of society for years to come. Charles Armstrong - an entrepreneur by profession, Charles brings his understanding of ethnography and technology together to create new tools and infrastructure to help us live better, and has som incredibly smart ideas about networks, crowdfunding and the future of business and society. I'm nominating him particularly for his work on emergent democracy and the brilliant One Click Orgs which is introducing democratic structures into the corporate world. Tessy Britton - another long-term collaborator of mine, I could nominate Tessy for the work she has done on learning and personal development which has shaped our work together on Mindapples. However, I'm particularly nominating her for her incredible work on Social Spaces, including the wonderful book Hand Made, and her bold action-research project of the Travelling Pantry, touring the country to test her ideas out in practice. Many PhDs have been awarded for far less.